As you know, I sort of mentioned that I was working on my blog and a few changes were being made. I'm very close to being done. Except I couldn't wait much longer to get back to blogging and sharing this delicious recipe. With that said, which I'll be going back to the recipe shortly, but I wanted to talk a little bit about why I decided to change my blog name. 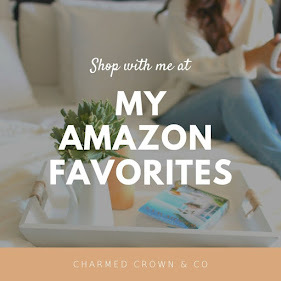 I've kept the same domain (charmedcrownblog.com) because that is exactly what it still is. The name change, Charmed Crown & Co came about because I wanted my blog name to finally have a definition of what it means to me. My blog is still very much a lifestyle blog, a space where I will continue to share all of my love for creativity, paint projects, love for home design, family & self love, basically everything that I've shared these last 4 years. Except now this space is also ME and my FAMILY, hints "Charmed Crown (me) & Co (family). I wanted it to be a definition of us and what inspires my purpose. Its them on a daily basis, I wouldn't have ever considered blogging if it wasn't for my family so hopefully that makes sense. The minimalistic look is fresh and clean and I wanted it to be more focused on my blog posts more than anything else. I want to continue building this blog and community and maybe even a brand. To continue inspiring you and build into future possibilities and endeavors for us (my family). Blogging has allowed me grow, to spend more time with my family, to creatively express myself and it makes me happy. In the end isn't that what we all want? is to love our jobs/hobbies and be happy. Creatively and financially it also helps me provide for my family in many ways and fulfills my creative soul. I want to be able to work mobile and take my job with me if and when necessary and not be chained to a desk. I have goals and I'll be sharing more with you as I progress. So I hope you'll continue to follow along and share this new experience with me. In the meantime I hope that sort of explains the name change and the new look. Now let's get to this Spiced Maple-Walnut Cheesecake shall we. This recipe was inspired by this recipe here. Except I used my local Kroger grocery store brand ingredients. I followed the recipe almost to the T. Except when it came to the sauce I used more cream than syrup. I didn't want the sauce to over power the cheesecake or be too sweet. But who am I kidding, I'm sure it would have been just as delicious. I simply could not resist this recipe and I truly could not wait to make it. I have so many recipes up my sleeve, that I want to make and try for the very first time, and all for the sake of everything that Fall stands for. I've been excited for this season, I hate to speed up the (I'm getting old speedometer, because my birthday month) but this is truly my most favorite time of year. And I love to bake and a sucker for a delicious cheesecake. This time of year just gives me all the warm feels of what life should be all year round. Warm, fuzzy, and kind. It just makes you sit sat and actually appreciate all the good around. Is it just me? Plus this season just makes you want to cook and bake all the yumminess. I hope you get the opportunity to give this recipe a try, definitely a winner and one you can share, bring to a dinner, have at home for the rest of the week, for any occasion this dessert is sure to give you a taste of the season. Don't forget to check out the original recipe here, but feel free to use your local grocer ingredients. Thank you for stopping by and checking out the new digs.